Valeria Levitin, who developed the eating disorder in her teens, is now 39 years old. As a child in Russia, her mother weighed Valeria constantly and she was told that she was too fat to be a model. She came to the United States when she was 16 years old. Now living in Monaco, Valeria is 5 feet 8 inches and weighs less than 60 lbs. Sickly and in pain, Valeria is on a campaign to help young girls avoid this devastating illness. Sadly, she has received hundreds of letters from girls who want to be thin like her. 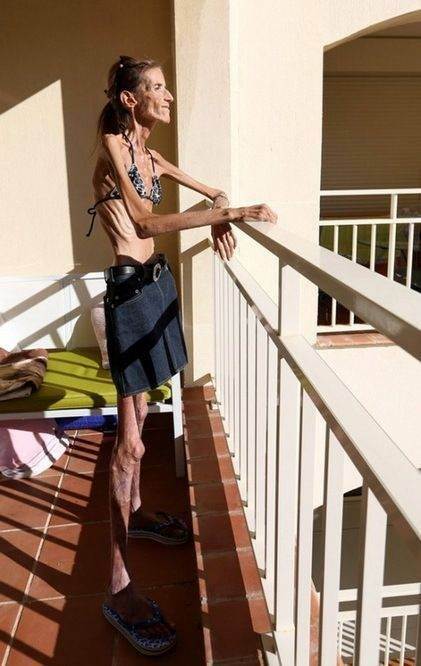 This entry was posted in Uncategorized and tagged Anorexic, eating disorder, freaks, Skinniest Woman in the World, Valeria Levitin, world's thinnest woman. Bookmark the permalink.